LIMITED TIME DEAL: Now through 1/31, use coupon code holiday2018 to save 15% off any length subscription! This month was all about science – as a grown woman who likes to play with legos – I think it goes without saying that I’m a bit of a science nerd as well, so I love this theme! Lego Science Lab designed by Tyler Clites – Estimated Value $10? The first build was pretty simple to assemble and contained only 38 pieces. It was a mini science lab, designed by Tyler Clites. I thought the detail was fun, but not outstanding, and the whole thing took me under 5 minutes to build. Fun Pack – Estimated Value $5? A handful of science lab related extra were included in the box. Billy The Science Guy – Estimated Value $5? Are all men in science named Bill? This guy is the perfect figure to work in your mini science lab. Circuit Cubes Kit – Estimated Value $35? These electronic building blocks are compatible with Legos. The kit received in this box was a custom curation and contained the circuit cube, some wires, some light reflective legos, and the other materials needed to create a few different projects. First, I made the light tower. It was pretty straightforward, once I figured out that there was a right and wrong connection to the metal spokes on the circuit cube. I love that the cube is chargeable with a USB cord (included) – and you don’t have to worry about replacing tiny batteries. I was also surprised by the amount of light that this little bulb gave off! Next, I made the flashlight, followed by the gobo flashlight which enabled me to project a star. The final project was a light mixer – which I had no problem building, but I didn’t really understand the point of it. I think of the projects relating to this cube kit, hands down the flashlight was the most fun. Verdict: This was a fun delivery – the star for me was the circuit cube. I liked the theme of weird science, but I do wish that the builds would have been a bit harder. As an adult, it took me probably less than 30 minutes to do all of the projects – With that in mind, this is a good subscription for school-aged children, and one that a parent and child could enjoy together. As for value, I think that the circuit cube set alone would have exceeded the $33 / month ($27 + $6 shipping) – so I do think the value is there, especially since you receive exclusive products. Can you still get this box if you sign up today? No, you will receive the December box. The current available theme is noted in the top banner of their website. 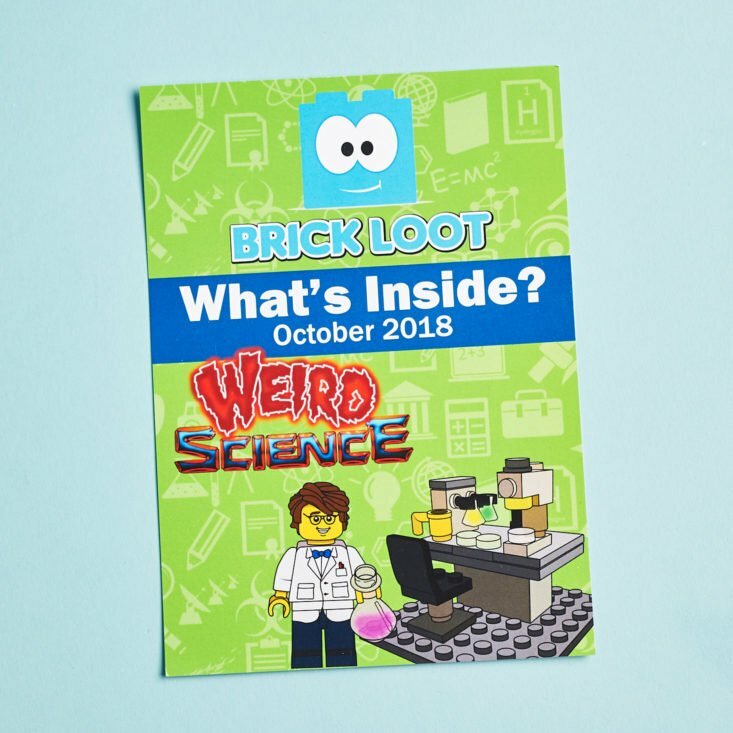 What do you think of the October 2018 Brick Loot?